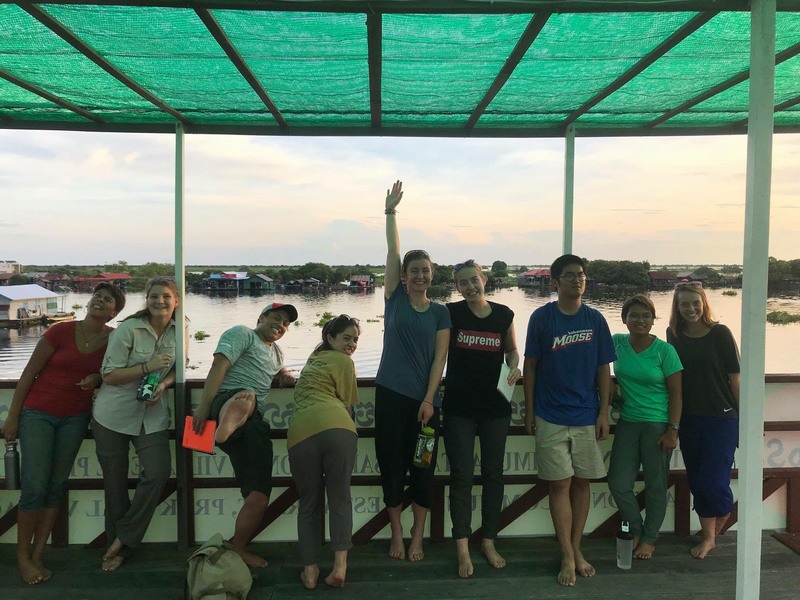 [post_content] => At the beginning of the fall semester, we asked student Makenna Hutchinson about her first impressions of Cambodia. Now, as the semester comes to a close, she shared her thoughts with us again. I realized early on that this program required hard work and commitment, in addition to a lot of early mornings. However, there wasn’t a single 6:30AM morning that I didn’t wake up knowing that I was going to learn something that I had never even considered before. It’s easy to apply the topics I learn in environmental studies classes to the United States because I know the problems there inside and out. But Cambodia is a completely different country, with a strikingly different catalogue of environmental problems that need attention. I love that this program is dedicated to diving straight into the most complex, confusing, and sometimes discouraging aspects of environmentalism and governance that are specific to Cambodia. My perspective on environmental issues has widened a lot this semester, and I hope to be able to keep my eyes and mind open to the problems that seem insignificant on a global scale, but have serious implications for the world’s future. You’ve been in the country for a full semester - tell us your impressions of it now. I know that my family and friends are so tired of hearing me say “I think I found the most amazing place I’ve ever seen!” but I can’t help it! Every single place we’ve visited was more vibrant, lively, and beautiful than the last place. There is so much life to admire in Cambodia. Sitting and writing this looking out into a lush forest dotted with small, endearing bungalows at the Indigenous People’s Lodge, I know that there’s not a corner of the country that’s absent of life. And that life comes in so many forms: Molly the gibbon chasing you through Phnom Tnout Wildlife Sanctuary, insects buzzing around the ground next to your bungalow, people singing karaoke through a loud speaker in the middle of a Bunong village, motos weaving unnervingly close your tuk tuk in Siem Reap. Everything about Cambodia screams “I am alive! !” and witnessing it all is my favorite thing about being here. The Center is our home base. I have come to feel very settled in my little nook of a bottom bunk. 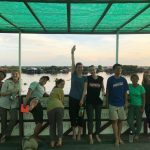 It’s the place that we all have started to consider our “Cambodia home.” Toward the end of tours and on long bus rides, I always thought about how nice it would be to curl up in the lounge or sit out in the common space with all my friends. Plus, even the best restaurants pale in comparison to the delicious dishes and lovely friendship that our cooks, Maly and Kongkea, have given to us. Living at the center is just like living in a giant house with an enormous family. It’s easy to form a bond with all of the students and even the professors while at the center together. Although it’s difficult to find places and times to be alone, I always found myself wishing my friends were with me when I was alone. My best piece of advice would be to not spend too much time in your room! Academically, my biggest challenge has been mustering the motivation to focus on my schoolwork when there were so many other activities that I knew I could be doing instead. There were always times where I sat in a café with my computer in front of me and thought “Maybe I’ll just go shop around for a little bit” or something that lead me to some serious procrastination. I had to continuously remind myself that I would be here for three whole months, and I’d have all the time in the world to “shop around a little bit.” Sometimes that allowed me to focus, but sometimes I’d just go shopping. I think it’s been the most difficult to see the effects of poverty, especially regarding children. There were a few times this semester when we visited big cities, and young children approached me asking me to buy something from them. I recognize the immense privilege that I have in the States, and it was humbling to see such a stark difference in wealth distribution between Phnom Penh and my hometown. Being in those situations evoked a lot of guilt for me, however it also allowed me to think more critically about privilege and how it can be used to help others in similar situations to the children I was seeing in larger cities. For that, I am thankful. My number one favorite memory from this semester is from the mangroves. 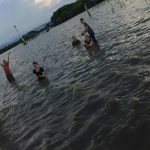 It was the late afternoon, and we had spent the entire day lounging around the wooden platforms that stretched across the young mangroves that had been planted by visitors before us. 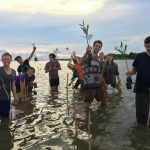 When the tide was low enough and we finally got around to planting some mangrove trees of our own, we were all a little sleepy after having relaxed on the water all day. 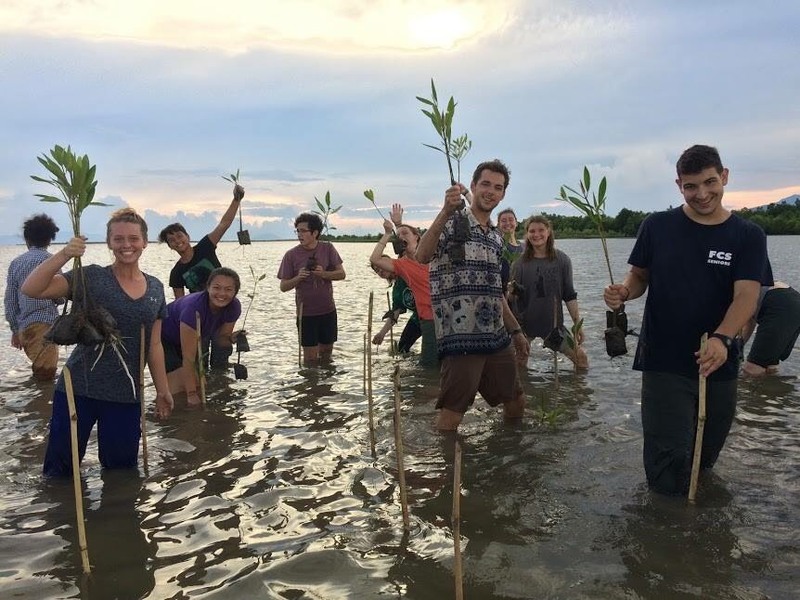 Knee-deep in water and ankle-deep in mud, we planted 101 trees as a team. As I put my last seedling into its hole and tied it to its post, I see an enormous glob of mud fly from none other than our SAM Arden’s hand and smack into the center of someone’s back. That was it. 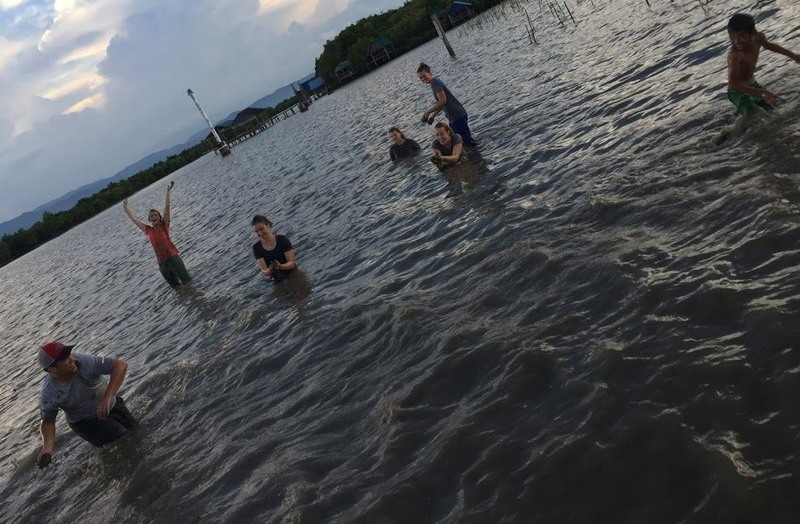 All of the students broke into a massive mud fight in the middle of the new-growth mangrove forest. Every person had dark brown splatters of dirt all over their arms and faces. Some of the professors even joined in! There wasn’t a single person who wasn’t smiling or laughing the entire time. Our battle wound down just as the sun was setting, so we all floated around and watched the sky streak with pastels before getting on the boats to head back for dinner. It felt like a scene from a movie. I don’t think I’ll ever forget that. 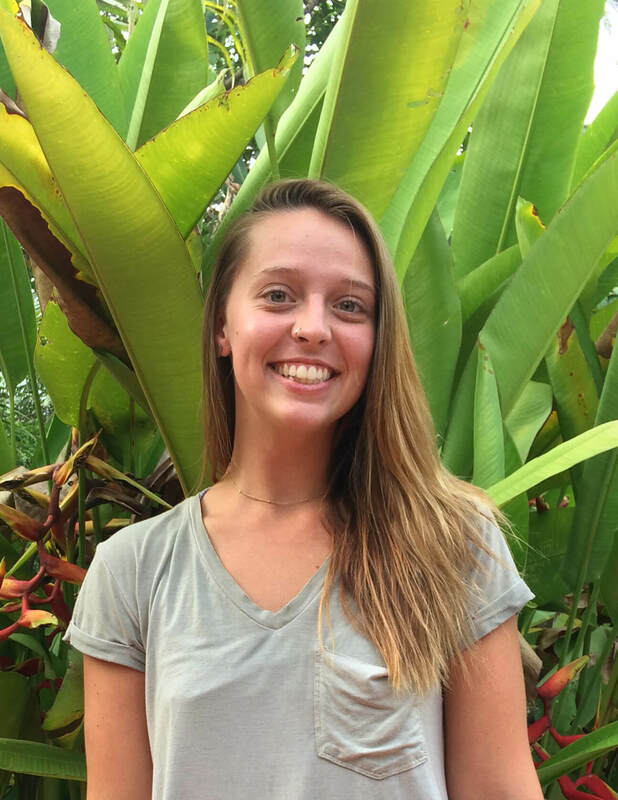 At the beginning of the fall semester, we asked student Makenna Hutchinson about her first impressions of Cambodia. Now, as the semester comes to a close, she shared her thoughts with us again.